This is just a picture I took a year ago, but just love and thus need to post here. 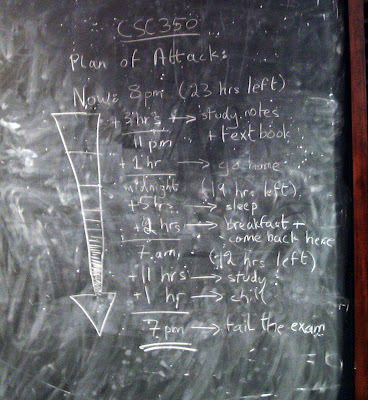 Studying for exams, I came across this on the blackboard of one of the reading alcoves the Bahen Center. I think we've all been here before, and come up with similar study plans. I'm so happy exams are done for another few months. Posted by Andrew at 11:40 a.m.